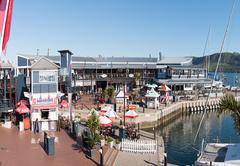 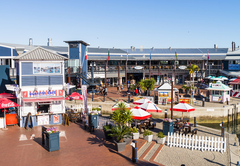 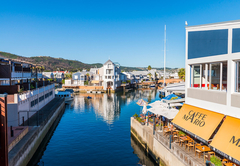 The Rex Hotel is a 4 star graded hotel offering Knysna accommodation for tourists and visitors of on the Garden Route. 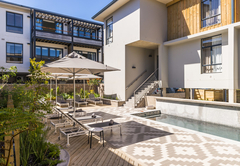 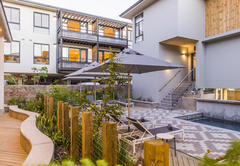 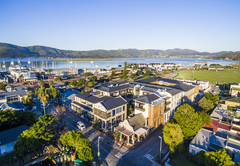 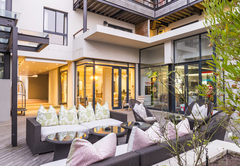 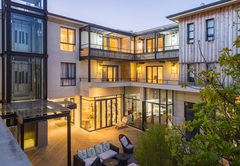 One of Knysna’s most elegant and sophisticated accommodation offerings, The Rex Hotel promises its guests superior service and exceptional comfort. 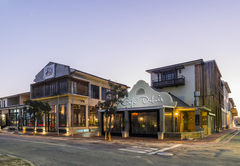 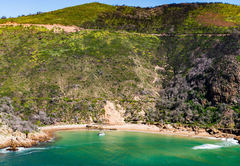 Located on the world famous Garden Route, The Rex Hotel is one of the most exhilarating getaways in its class. 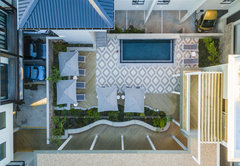 With an eclectic mix of modern and classic comforts and capturing the essence of four star luxury, the impeccably appointed Rex Hotel offers travellers a gateway to world-class restaurants, blossoming forests and the shores of the serene lagoon. 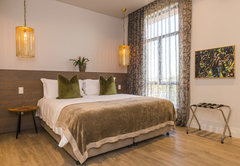 The Rex Hotel offers 30 luxurious and spacious en-suite rooms, a sophisticated mix of contemporary and classic comfort with cool colours and rich fabrics featuring kitchenettes, air-conditioning, remote controlled LCD televisions with selected DStv channels and wireless internet. 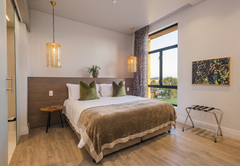 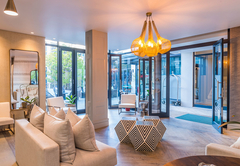 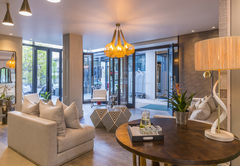 Accommodation consists of standard rooms, 1 bedroom luxury apartments or 2 bedroom luxury apartments. 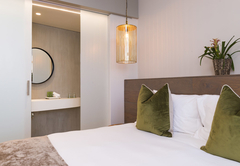 All rooms are equipped with a Digital Safe, Satellite Television & DVD Players, Internet access, Mini Bar / Bar Fridge (stocked on request), Tea/Coffee making facilities, Hairdryers and kitchenette (excluding the standard rooms). 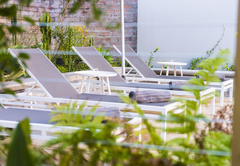 With stunning décor and meals that posses the wow factor, the sophisticated yet casual Rose Café is situated at The Rex Hotel. 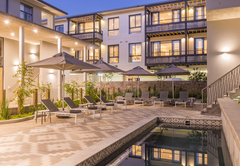 The Executive Chef successfully marries cultures and regions in many of the signature dishes on offer. The Rose Café is open for breakfast, lunch and dinner from as early as 06h30, seven days a week. 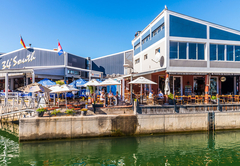 The menu changes seasonally as only the freshest local, free range and organic (where possible) products are used to make the most delectable food. 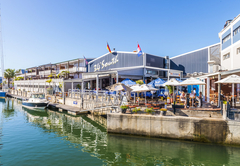 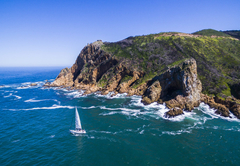 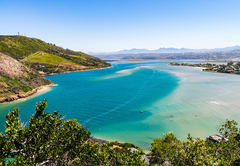 The Rex Hotel offers countless leisure activities in the vicinity such as the Knysna Elephant Park with seven elephants roaming the small reserve and the Outeniqua Transport Museum with an excellent collection of trains reminiscent of yesteryear. 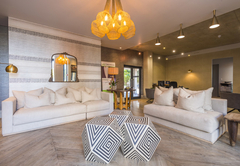 The Inter-Leading Luxury Studio Apartment can accommodate a maximum of 2 adults and 1 child under 12yrs. 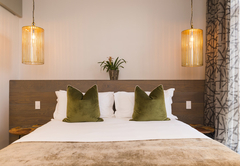 The room offers a separate bedroom with en-suite bathroom, separate lounge and kitchenette. 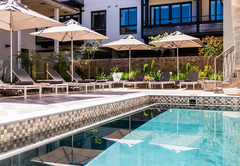 The Twin Luxury Studio Apartments can accommodate a maximum of two adults. 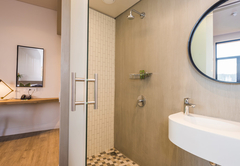 The room offers a separate bedroom, separate bathroom, separate lounge and kitchenette area. 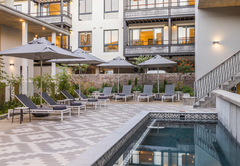 The King Luxury Studio Apartments can accommodate a Maximum of two adults. 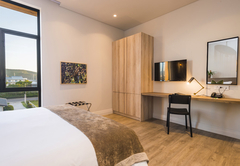 The room offers open plan kitchenette, lounge and bedroom with a separate bathroom with shower only. 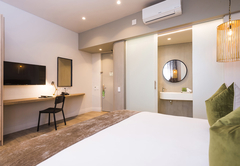 Response timeThe Rex Hotel typically responds to requests in 5-10 minutes.